The premise of Ballz is straightforward enough. An entity known as The Jester has challenged eight fighters to enter a tournament. Whoever wins will be granted a wish. The lineup of fighters includes: a clown from the circus, a bodybuilder, an angry rhinoceros, a ballerina, a caveman, a sumo wrestler, a superhero, and a flatulent monkey. 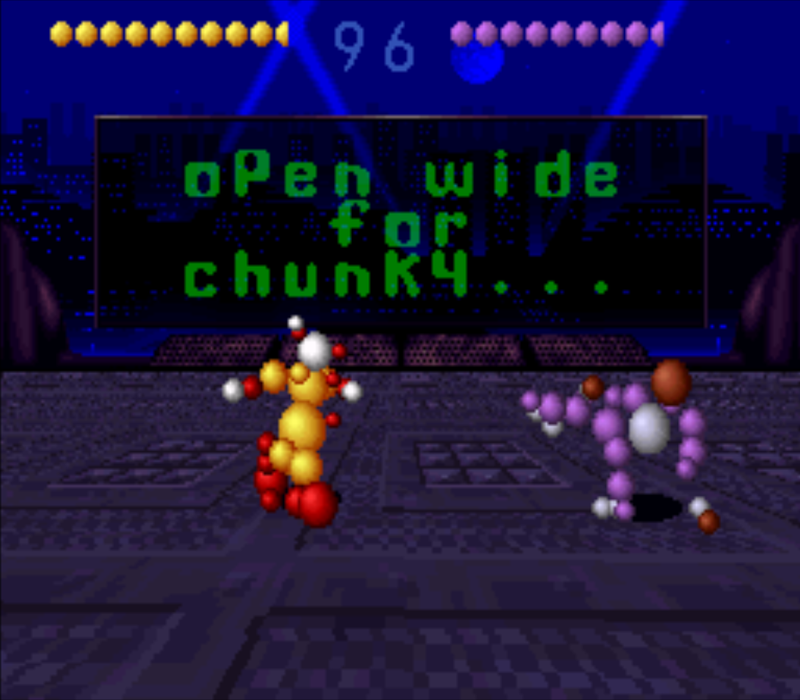 The one common theme connecting these disparate fighters is that their bodies are composed entirely of spheres. Ballz stands out from other fighting games with its decidedly unusual control scheme. While most fighting games had multiple punch and kick buttons, Ballz only allots a single button for each action. In fact, it also differs from the standard fighting game in that it has an actual jump button. Though jumping is typically accomplished with the press of a button in a platformer, a fighting game usually required players to hold up on the control pad or joystick instead. Because fighting games usually didn’t ask players to navigate precarious platforms, this was an acceptable alternative. A player unfamiliar with this game may be questioning why a jump button is necessary in the first place. This is where Ballz truly forges an identity distinct from that of its rivals. Pressing the control pad up or down causes your character to move in that direction. That’s right, while every other fighting game was content existing on a two-dimensional plane, Ballz adds depth to the proceedings. This means, among other things, that you can dodge attacks simply by moving out of the way – something thought impossible in contemporary efforts. Having braved the world of 3D, this is the point in the review in which I would praise PF Magic for providing such a forward-looking experience. 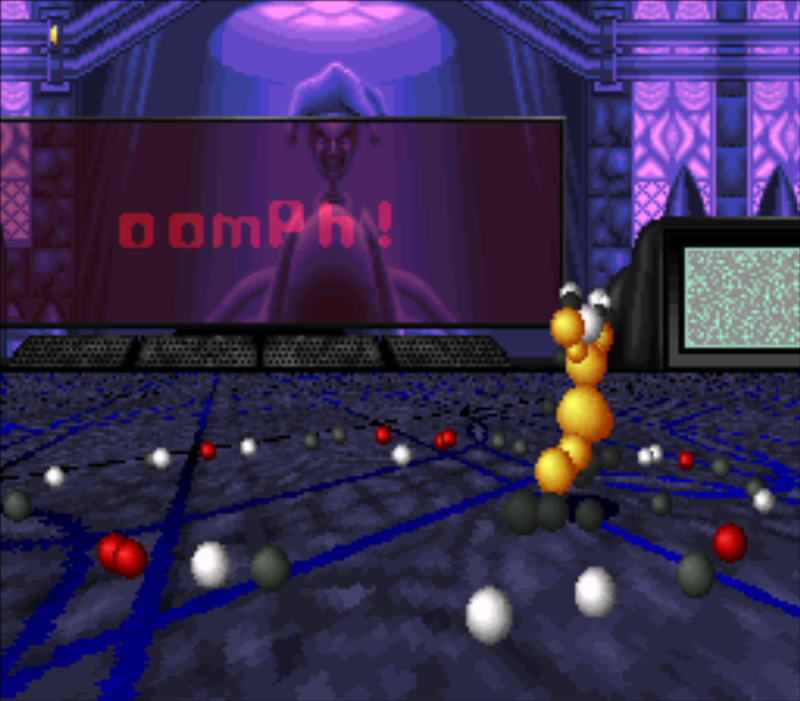 After all, in 1994, the idea of a game world existing in three dimensions was practically unheard of. The pioneering 1992 first-person shooter Wolfenstein 3D merely tricked players by drawing flat graphics in a way that made them look three-dimensional. In reality, it was no more three-dimensional than Super Mario World. 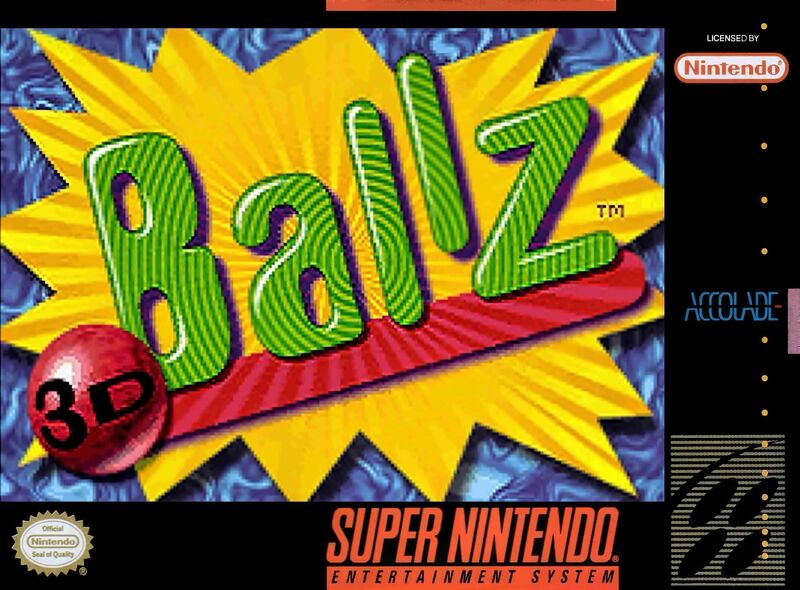 Even if you were to use Wolfenstein 3D as a benchmark for 3D gameplay, Ballz having been released a mere two years later would be quite commendable – especially in light of its third-person perspective. That moment will never occur because Ballz is a complete disaster from start to finish. Any fighting game lives or dies based off of its controls and Ballz has some of the most unresponsive you will ever see. Even the simple act of jumping is rendered needlessly difficult. You can hold down the jump button to stay in the air slightly longer, but you will be lucky if you can reliably dodge anything. Even with the excuse of taking place on a three-dimensional plane, it’s very unintuitive to use a button to jump in a one-on-one fighting game. This means your first few sessions are going to be spent simply getting used to the controls. The art of punching and kicking in this game is a matter of being reasonably close to your opponent and hoping the attack connects. The reason I say this will become clear should you throw caution to the wind and try Ballz out for yourself – the hit detection is atrocious. Your attacks rarely stagger your opponents, meaning you must contend with the fact if you’re close enough to hit them, they’re close enough to hit you. This means the experience of playing Ballz often boils down to mindlessly mashing your preferred attack button and hoping for the best. With each successful attack, you’ll realize that the characters can take a lot of punishment before being shattered. A clean hit usually takes off a fraction of a unit on the stamina gauge. One of the reasons Street Fighter II was, and continues to be, such a beloved game is because of its memorable character roster. Even when a majority of the players were unaware of its backstory, Capcom managed to lend its cast a lot of character through subtle cues such as their special abilities and victory animations. You will find none of these subtle in touches in PF Magic’s effort. The characterization of the Ballz roster begins and ends with their vaguest surface elements. Bruiser is a bodybuilder, Crusher is a rhino, and Divine is a ballerina – that is the full extent of their characters. 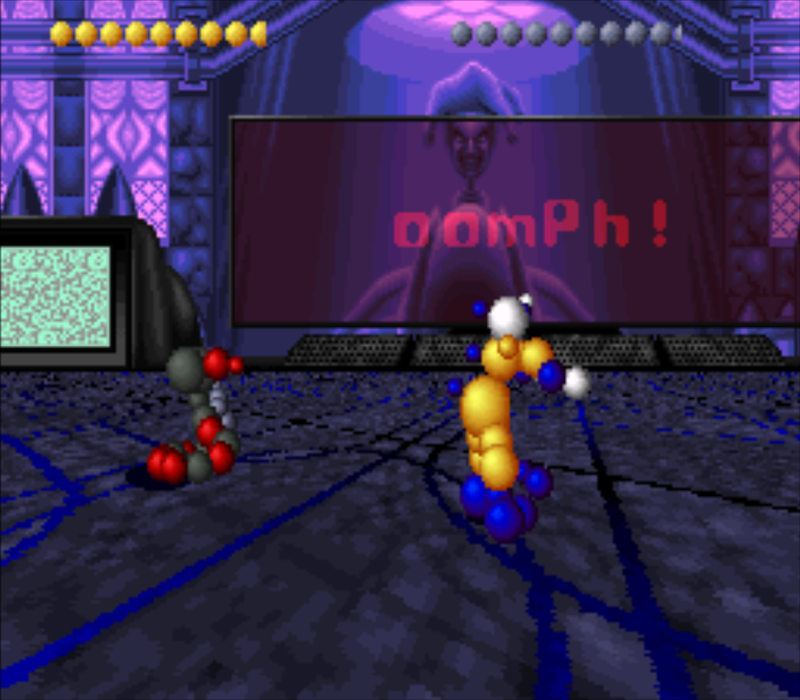 The only distinctive one is Boomer the clown – and is mostly attributed to his bizarre character selection animation wherein he thrusts his hips rather suggestively. In other words, the only character with a distinctive personality is the result of the programmers not thinking through their implications. Then again, given that they, without any irony, decided to consciously name their work Ballz, it does fit the sophomoric tone such a title would imply. 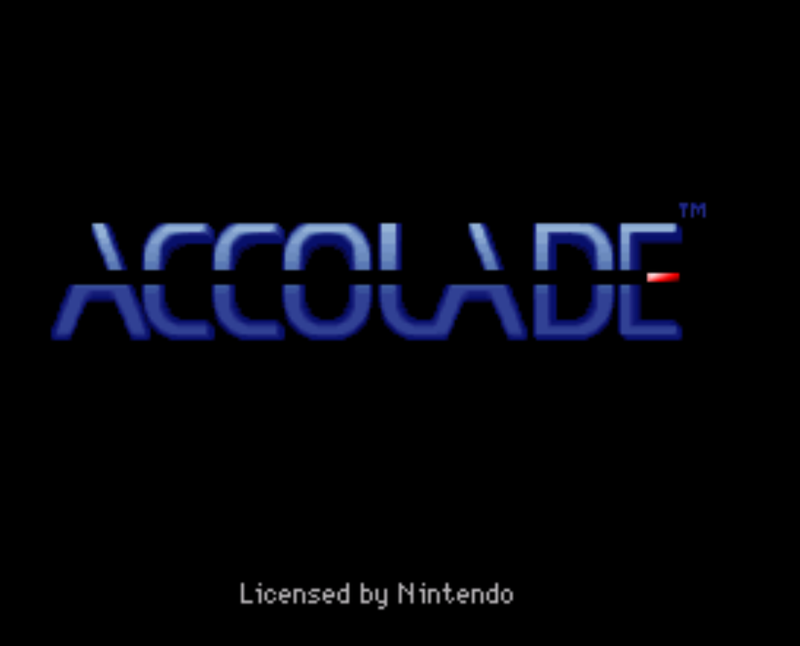 In fact, the introductory music in this game is a chaotic mishmash of random voice clips that, when put together, resembles the stereotypical soundtrack to an X-rated film. Many of these voice samples play during the actual game – usually when Divine is selected. I can only imagine the incredulous looks on the parents who decided to buy this game for their children. The only thing that could match it is the sheer confusion and frustration these hypothetical kids would feel actually attempting to play it. Or the looks of the friends of said kids in the event they earnestly challenge them to a “best out of 21” match. 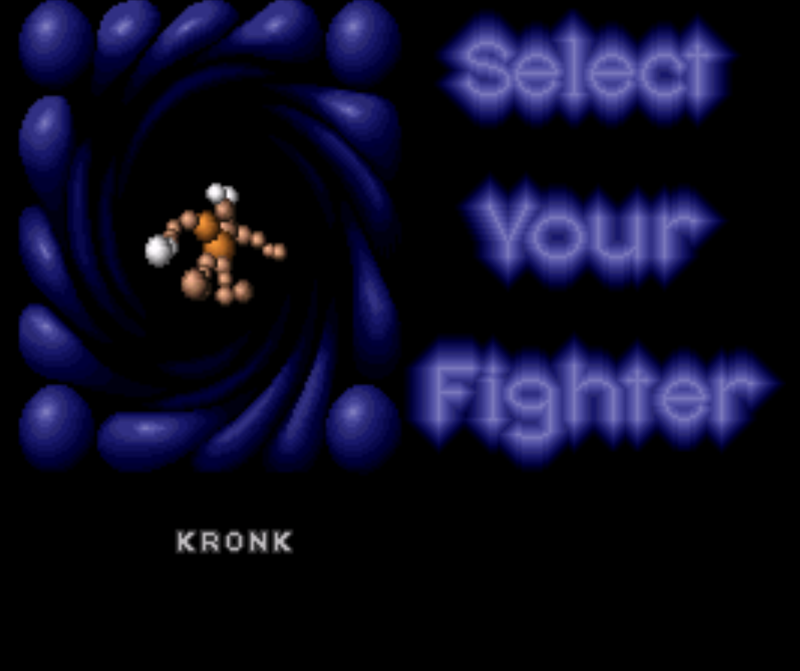 Each character has a selection of special moves available to them; executing them involves pressing buttons in a sequence. There are also moves analogous to fatalities from Mortal Kombat you can use when your opponent has two life units or fewer. However, even after knowing what to do, I could never get them to work consistently. While Street Fighter II required precise timing to use a special move, it was simple enough to learn with enough practice. 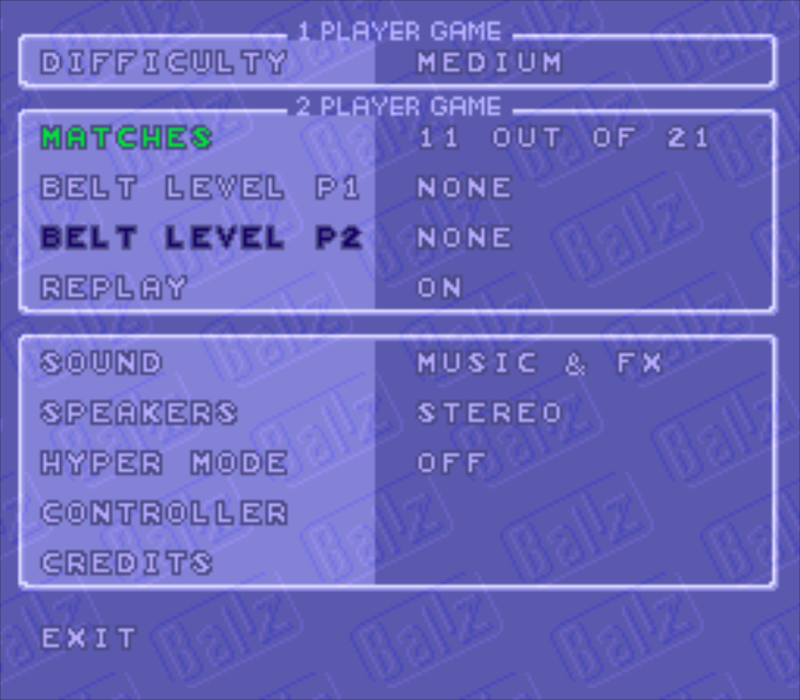 Because the controls in Ballz are so unresponsive, you will likely begin relying on basic punches and kicks to get you through the game. For the first few fights, I was amused because I found that by spamming the kick button, I could defeat the opponents without too much trouble. 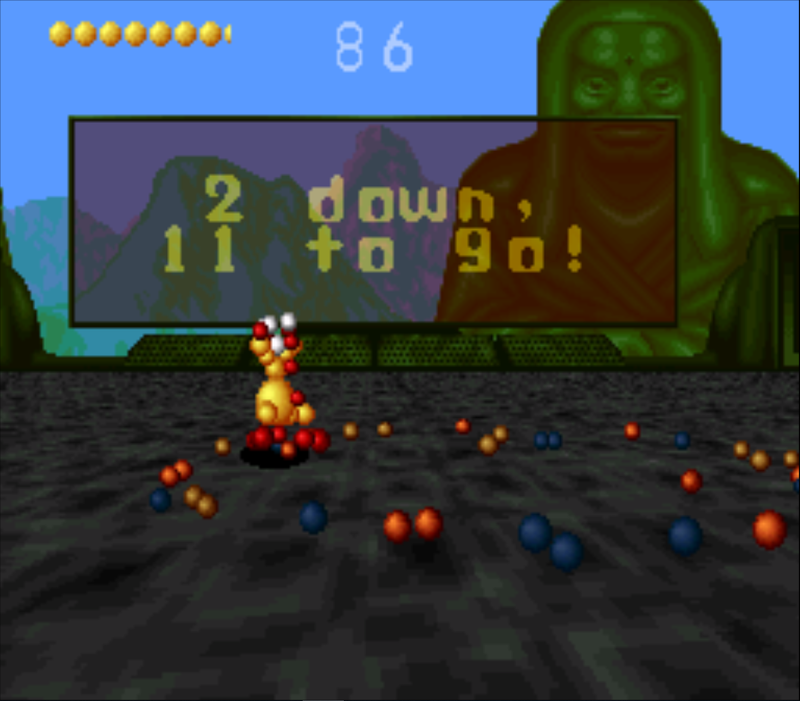 This feeling of triumph came to an abrupt end when I learned Ballz features five boss characters. The first such boss, an ostrich named Guggler, didn’t give me too much trouble until it stuck its head in the ground. When it did so, it recovered its health. Because most characters aren’t fast enough to reach the ostrich before it recovers its health, you must resort to another tactic: taunting. 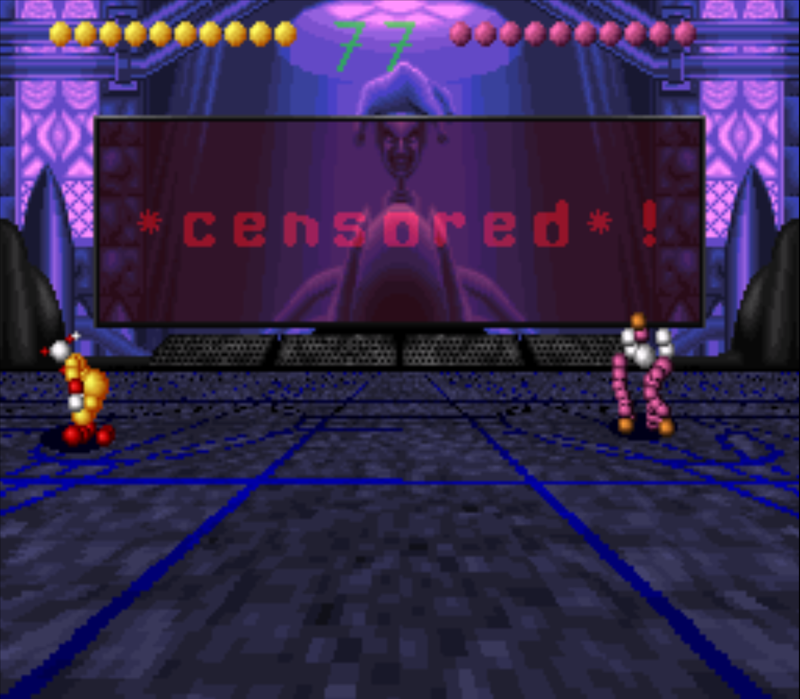 Among the nonsensical phrases adorning the monitors in the background is “Taunt the Ostrich!” As it turns out, this sentence wasn’t formed as the result of the developers putting random words together, it’s legitimate advice on how to defeat the boss. By pressing the punch, kick, and jump button all at once, your character will taunt their opponent. This increases the amount of damage they inflict with their next attack. By doing this anywhere from two to five times in a row, you can defeat you opponent in one strike. In most encounters, this is useless because your own character is vulnerable as they go through their lengthy animation and there is no way to cancel it. If they get struck in their taunting animation, they are the ones who take extra damage. Therefore, only against the first boss is this a viable tactic because as long as you don’t attack the ostrich, it usually remains in the starting position. 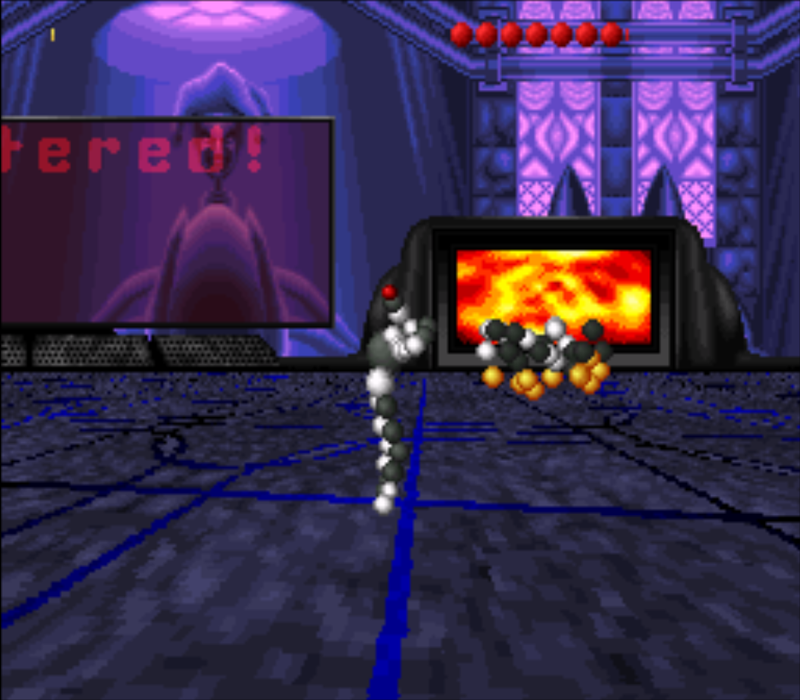 Among the other boss characters are a kangaroo and a dinosaur – named Bounder and T-Wrecks respectively. There isn’t much to say about these bosses; they’re just abnormally powerful opponents. When you reach the fourth boss, the genie Lamprey, you’ll have to contend with an opponent who is a master shapeshifter. Though this isn’t annoying in of itself, he can occasionally recover all of his health upon switching forms – usually when his stamina is low. Your character, on the other hand, only has one way to recover health. By pressing down on the control pad three times when low on health, your character will plead for mercy. Like taunting, this is useless because your character can still be struck during the appropriate animation, which defeats the purpose of doing it in the first place. While the first four boss characters had an array of cheap moves up their sleeves, their patterns could be studied through enough trial and error. Exactly why one would spend a significant amount of time attempting to play this game is a question for the ages, but my point is that they at least had some semblance of logic to them. None of this applies to The Jester; he gleefully breaks every single rule the fighting game genre had established. He can teleport, attack from a distance via psychokinesis, and disassemble himself. If you land on the spheres composing his being, you take damage. As a result of the imprecise jumping controls, this is nearly impossible. If by some miracle you manage to reduce his health bar, you get to breathe a sigh of relief. Seconds later, he revives himself and punches out your character. No matter how many times I replayed his match, I found I couldn’t avoid this attack. Having to knock down a character twice in order for it to count with only one health bar is an inexcusably awful design choice. It was right there and then that I decided I had won the game. It was being a sore loser, so I wasn’t going to entertain playing on its terms any longer. Apparently, The Jester transforms your character into a boss upon defeat whereupon you must play the game a second time to get the true ending. Calling this the product of unrealistic expectations would be a grand understatement. I do give PF Magic some credit for attempting to make a third-person 3D game two years before the most significant shift in the medium’s history. Unfortunately, the result is so disastrous that it’s for the best no one took cues from them. 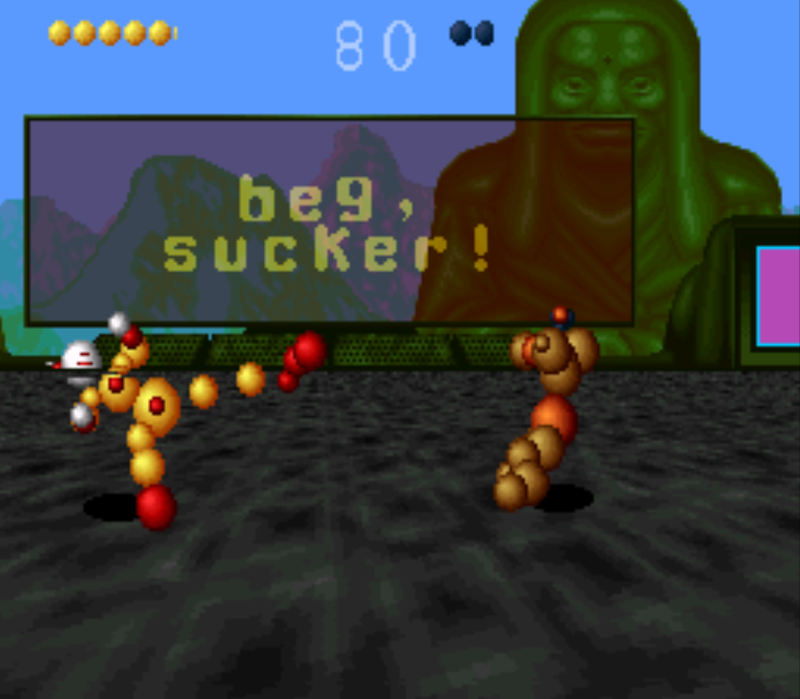 The problem is that while quality 3D fighting games would be made after Ballz, everyone was still mentally thinking in two dimensions in 1994 – including PF Magic themselves. This means you get a 3D game with 2D sensibilities. This severe disconnect results in an unplayable mess that you don’t really control as much as you thrash around with and hope for the best. It’s completely unwelcoming for newcomers and a veteran gamer is going to pass it up in favor of a title that isn’t irreparably broken. This is especially bad because one of the reasons competitive fighting games are so popular is because they’re easy to pick up and play. With the amount of strategy players have developed over the years, it can be said that a good fighting game is like Go – easy to learn and difficult to master. Ballz, on the other hand, is difficult to learn and nigh-impossible to master. Under no circumstances, even morbid curiosity, could I recommend playing this game. At best, you and a friend might get a chuckle out of how incompetently made it is, but any amusement derived from such an activity is doomed to be short-lived. Experiments are important for the growth of any medium, but this is an example of one that exploded in the developer’s faces. Balls! I remember seeing this in SNES magazines. Now for the time those graphics would grab your attention, but it looks like they went for a gimmick over proper gameplay. Fools! I can’t really think of an instance wherein choosing to put all of one’s eggs in the presentation basket has ever worked in the long run (just look at Avatar). Then again, Ballz is a case in which that strategy didn’t work in the short term either. It should’ve been apparent even at the time that it was a major step down from most fighting games. Clearly a bit of desperation kicked in there. 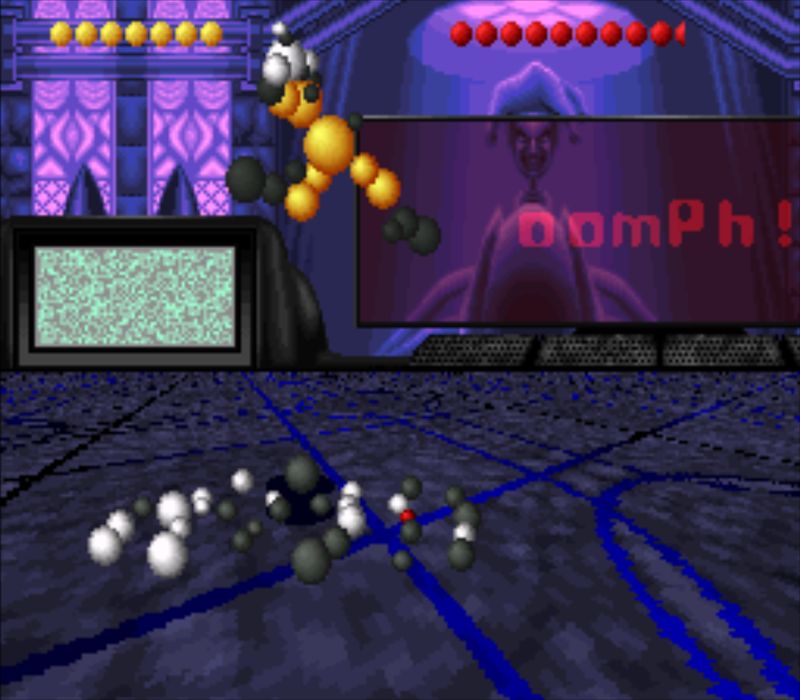 Reminds me a bit of Clayfighter 63 and 1/3 on the N64. Just a disaster of a beat-em-up. I think your score is too generous. Perhaps, but I don’t like the idea of breaking my own grading scale. Plus, I’ve played at least four games that are worse (NES Dragon’s Lair, Metal Morph, Dr. Jekyll and Mr. Hyde, and Nerves of Steel), and they all got a 1/10. Nevertheless, you were completely justified in giving it a -1%; the game is total garbage and no one else should play it. I couldn’t believe it actually got fairly positive reviews back then. Surely 0 is in your scale? No, it only goes down to 1/10. Nonetheless, you can rest knowing that if you ever see me dish out that grade, the game in question really is irredeemably bad. Fair enough. I look forward to you playing a game so bad it gets 0. Are the three that come to mind for me. I am not sure I have played this one. Probably not, because I do seem to have recurring nightmares regarding its awfulness, but for some reason its visual presentation makes a bell ring in my head. Maybe I had seen it somewhere before I saw your post. I myself learned about Ballz back in 2007 when the folks at ScrewAttack made a Video Game Vault episode about it. I couldn’t believe how bad it looked, and playing it revealed the gameplay was every bit as bad as they said – even worse given that they didn’t mention how cheap the bosses were. Anyway, that this is a game bad enough to give people who have never played it nightmares speaks volumes about its quality, or lack thereof. I played this once, with a friend. We turned it into an endurance challenge, trying to use it to make each other as frustrated as possible so one of us would give up. It lasted about half an hour. I think that says a lot about what sort of game we’re looking at here. Seeing as how Ballz is a bone fide frustration generator, you two certainly picked a winner for such a competition. I’m surprised you held out for that long.